Becker Circle by Addison Brae is an exciting meld of sleuthing, crime, and romance. When Gillian decides to leave her hot-tempered boyfriend and move to another town, it is for a fresh start. She lands a second job as a bartender. A few days into her job, a notorious drug lord in the vicinity dies a few feet from the table Gillian is serving, and while people and the cops think it could be suicide, Gillian and the guitar player think it is actually murder. So they set out to uncover the face of the murderer. Follow their gritty story as they look for clues to the mystery and the shattering truths they find out about the murderer. But then, something is happening to their hearts as they seek answers - can they give love a chance in the midst of the chaos? 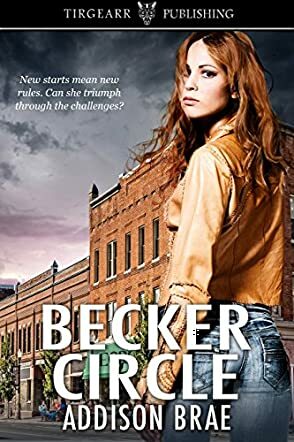 Addison Brae establishes her trademark for romance, a great storyteller who creates characters and an exciting world that readers will want to navigate — the Becker circle. Gillian is a very complex character and when readers meet her at the beginning of the narrative, they have the impression that she can be very dependent and insecure, but she slowly morphs into a character that can stand on her own and who is determined to take control of things. I enjoyed the buildup of the attraction, the skillful way the scenes are constructed, and the author’s ability to convey the atmosphere in a bar — vividly and realistically — while immersing readers in a culture that suits that world. Becker Circle is suspenseful and the tension builds up quickly into a climax that is as intriguing as it is satisfying. Great cast of characters, a spellbinding narrative voice, and a wonderful plot, spiced with red herrings that will make you keep turning the pages.